Identification of a single-nucleotide exchange in the UNC13A gene in the patient. (A) Sequence chromatograms demonstrate a single-nucleotide exchange in 1 allele of the UNC13A gene in the patient that is absent in his parents’ alleles. (B) Domain structure of Munc13-1. 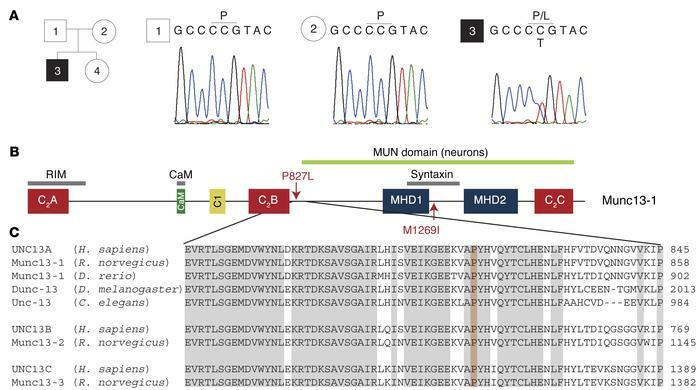 The priming function of Munc13-1 is mediated by a C-terminal MUN domain (green horizontal line), which is composed of 2 Munc13-homology domains (MHD1, MHD2) (88) and the C-terminal C2 domain (C2C) (54, 89). This region contains the minimal binding region (gray horizontal line) for syntaxin (90). The central region of Munc13-1 is composed of 3 regulatory domains, a Ca2+-calmodulin (CaM) binding domain (33, 35), a C1 domain (63, 91), and the central C2 domain (C2B) (37). The positions of the point mutations that were analyzed in the present study are labeled by red arrows (amino acid positions refer to the murine sequence). The N-terminal C2A domain binds RIMα proteins (68). (C) Amino acid alignment of Munc13 proteins from the indicated organisms shows high sequence identity (gray) in the region covering the mutated proline (red).